Entering the wide world of sake isn’t easy when you’ve only tasted hot, label-less shots at a sushi bar. For most sake neophytes, it’s like getting into craft beer after years of Bud Light or PBR. Entering the wide world of sake isn’t easy when you’ve only tasted hot, label-less shots at a sushi bar. For most sake neophytes, it’s like getting into craft beer after years of Bud Light or PBR. Enter Zuma, NYC's new outpost of a Japanese mega restaurant based in London. Zuma makes its own sake and employs sommelier Samuel Davies to oversee a list of about 70 more selections. Here, he shares some of his favorite bottles for a range of tastes and styles. Junmai: Junmai sake is pure sake that is made only with water, koji mold (which converts the starch to sugar), yeast and rice that has been milled down at least 30%, leaving 70% of the grain. Typically, junmai sakes are full-bodied with bright acidity. Ginjo: Ginjo is almost exactly the same as junmai, except the rice needs to be polished so that just 60% of the grain remains and some distilled alcohol is added during brewing. Ginjo sakes tend towards the lighter end with a crisp, clean floral and/or fruity flavor. Daiginjo: One of the most prized types of sake, daiginjo sakes are made with rice that has been stripped of at least 50% of its outer layers—though many ultra-high-end daiginjos are made with rice that has had 65% polished away. These sakes are complexly flavored and refined. Junmai Daiginjo: This highest grade of sake, junmai daiginjo sakes are daiginjo sakes that are made without any additional alcohol. High in acidity with umami-like flavors, junmai daiginjo sakes are for super-special occasions (especially the one chosen by Davies). Sparkling: Low in alcohol, spritzy and slightly sweet, sparkling sake is fairly new to the sake world but has quickly become a popular option. It undergoes a second fermentation in the bottle (much like Champagne), which results in a terrific fizz. Sparkling sakes are usually sold in small bottles. Nigori: Creamy, cloudy and sweet, nigori sakes are unfiltered, which means some unfermented rice solids are left in the mix. 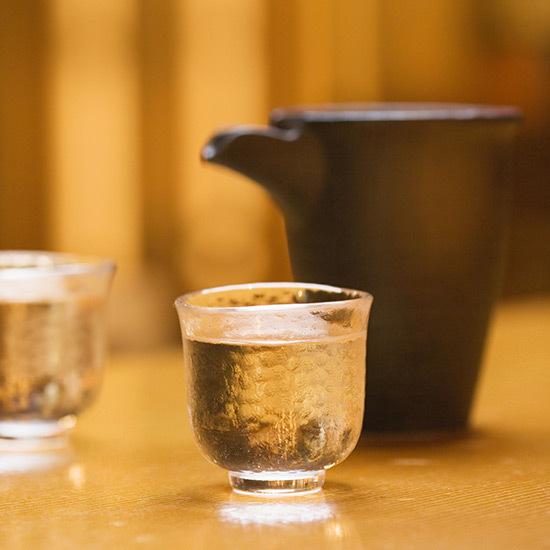 Typically, this style of sake is served after dinner or served as a cooling complement to super-spicy foods. While many other styles of sake can be served at a range of temperatures, nigori sakes should always be served chilled. Namazake: Unpasteurized sake usually released and served in the spring, namazake sakes are known for being sharp, ultra-refreshing and lively. Because they aren’t pasteurized, namzake, like nigori, should be drunk cold and soon after opening. Kimoto: Usually, sake gets a hit of lactic acid during the brewing process in order to protect the fermenting spirit from wild yeasts and bacteria. Kimoto sakes don’t get that lactic acid, instead brewers mash the rice, koji and water with long poles in order to oxidize the mix and encourage lactic acid to occur naturally. The result is a smoky, brightly funky sake.